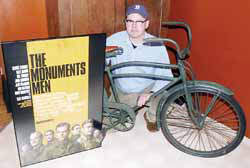 Bergerwerke Bikes are seen in Columbia Pictures epic film "The Monuments Men"
"It’s an often fascinating and suspenseful fact-based story, filmed on colorful locations with a great cast. Clooney’s “The Good German” co-star Cate Blanchett (who leads the Best Actress field for “Blue Jasmine’’) and frequent Clooney collaborator Matt Damon have the most screen time in the ensemble cast. Damon plays an art expert assigned to win the confidence of a suspicious French museum official (Blanchett) who may know where the Germans have hidden thousands of looted artwork earmarked for a Hitler-designed museum that will never be built. (However, even a great actress like Blanchett can’t sell an unlikely scene in which she attempts to seduce Damon.) 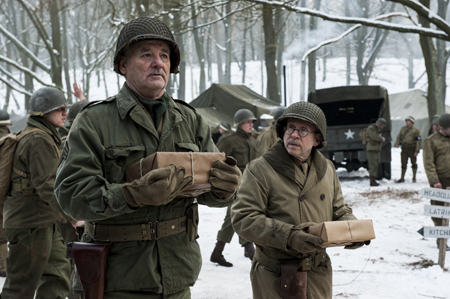 Bill Murray and character actor Bob Balaban (they appeared together in “Moonrise Kingdom”) have great comic chemistry as two middle-aged team members who are paired up for a mission — recovering famous paintings taken from Jewish art collectors. 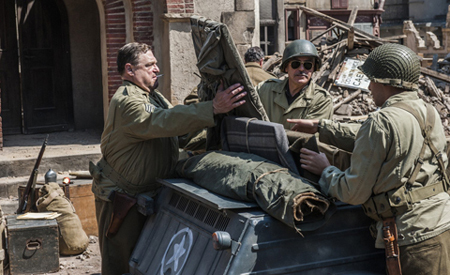 Also sharing most of their scenes, including bravery under fire, are French Oscar winner Jean Dujardin (“The Artist”) and character ace John Goodman." 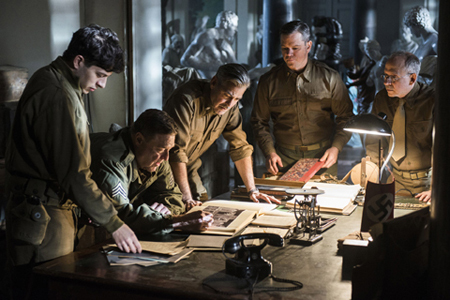 The film centers on an Allied squad comprising a group of museum directors, curators, and art historians. Their mission is to enter Germany with the Allied forces during the closing stages of the war to reclaim stolen artwork taken by the Nazis, returning them to their rightful owners. Principal photography of the film began in March 2013 at the Babelsberg Studios in Potsdam, Germany, and in Berlin. The town of Osterwieck in Brandenburg, as well as was the Imperial War Museum Duxford, Cambridgeshire were the settings for bulk of the scenes. The film was originally set to be released on December 18, 2013 but because of post-production delays, the film was rescheduled for February 2014, and was eventually released on February 7, 2014 at the 64th Berlin International Film Festival. Early last year, Babelsburg Studios contacted Bergerwerke requesting an accurately detailed and faithful reproduction of the classic military G519. 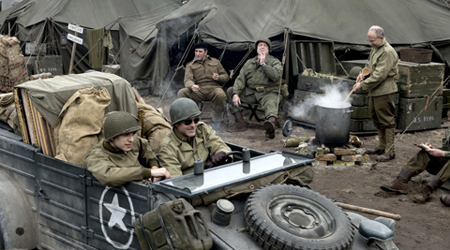 Within several weeks, a standard bwG519 Huffman model was shipped overseas to join the numerous vehicles and equipment used in the film. Look for Bergerwerke's bicycle as it makes it's way past the Siegfried Line onto Berlin! Site design by Blueschool Productions.Website copyright © 2012 Bergerwerke Bicycle, LLC. All Rights Reserved. All images, graphics, and content unless otherwise indicated are copyright Bergerwerke Bicycle, LLC and copying or using without permission is prohibited.